If you are travelling in a cruise holiday package and your cruise ship stop at San Martin port for the day, don't lose this great opportunity and visit this amazing paradise of Ballestas Islands from San Martin port in our exclusive half day tour. In this two hours tour to Ballestas Islands, you will see the enignatic figure of el Candelabro. an enormous figure etched long ago on a hillside of Paracas Peninsula, then a visit to the stunning ballestas Islands, a natural marine ecosystem where you can see thousands of marine species such sea birds, sea mammalas, penguins, dolphins and among other species that can be seen. You will be met by our guide at 9:15am at San Martin Port, then you will be transferred to Paracas town, at this point you will meet the rest of the group and board our speedboat to begin your adventure to the stunning Ballestas Island. 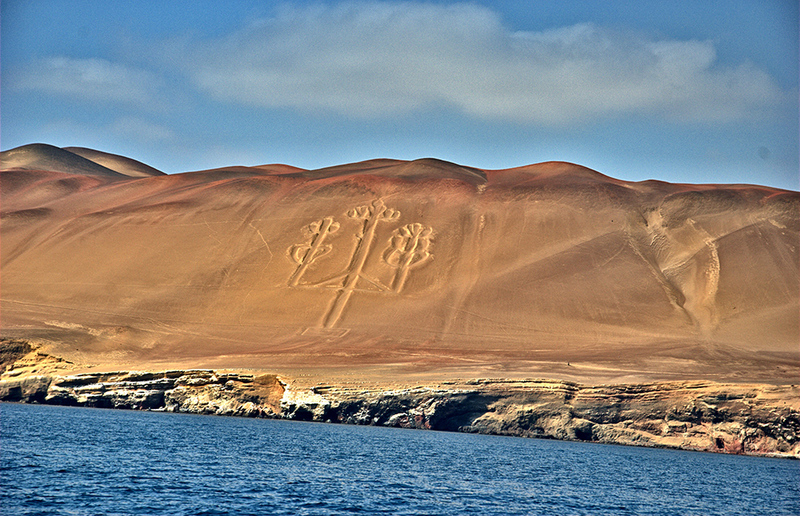 On the way you will stop at the Paracas Peninsula to see the enigmatic figure of the Candelabro. A stunning design drawn on the side of a hill in the Peninsula. Nobody knows for sure who did it or why. There are many hypotheses regarding its origin. Some believe it is related to the Nazca Lines but still found no proof or evidence that can define its creation. Afterwards will head off to Ballestas Island where you will enjoy a stunning world filled with birds and sea lions. Here you will visit the three islands at an allowed distance, navigating in some caves (this will be depending on the condition of the sea). At the end of the tour you will return to San Martin Port to re-join your ship. Recommended for: Families, couple and solo travellers. Pickup and drop-off from San Martin Port. Bottle of water or coffee. Tourist Tickets $5.5 per person. Departures are from San Martin Port at 09:15am. You will return to San Martin Port soon after your tour has finished. All our departures are 100% guaranteed!! Confirmation will be received at time of booking; a full payment will be required via PayPal or Visa. Soon after you have submit your booking, you will receive an electronic voucher via e-mail. For a full refund, cancel at least 48 hours in advance of the start date of your tour. If your ship has any delay in arriving, we strongly suggest to notify us three to four days in advance so we can arrange a new pick up time. We also suggest you to keep checking your emails in case the pickup time changes. Printed travel voucher or E-travel voucher along with your passport or any ID its required before boarding (verification purpose only). If you have any disability or if you need any extra care please contact us HERE. if you wish to customize this tour in private, please contact us HERE.